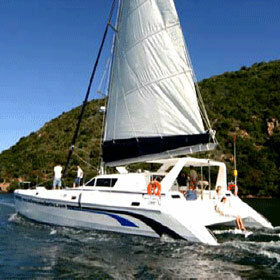 Enjoy a sailing trip onboard this elegant 44ft sailing catamaran. Sailing on a catamaran is ideal if you want to get close to the best shallow reefs for snorkeling and diving. She is also highly equipped and custom fitted for big game fishing. 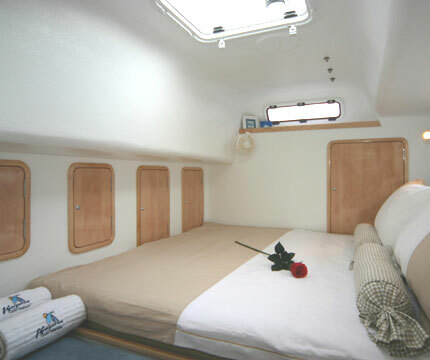 There are 3 King Size double cabins with en-suite facilities in each for up to 6 Guests. 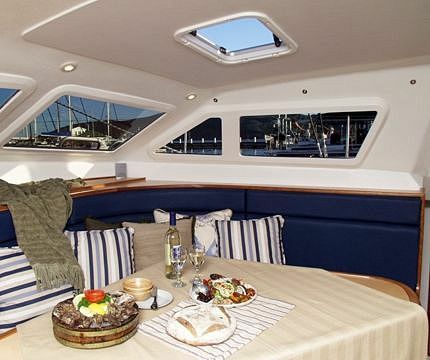 This yacht has all the facilities you may need including an entertainment system and TV DVD player with surround sound stereo. Its wide trampolines are the perfect spot for sunbathing or enjoying the evening breeze. The 3 man experienced crew including Professional chef will attend to your every need. Its entertainment and relaxation areas are spacious and include an indoor lounge and dinning area, an outdoor covered saloon and 2 large trampolines. Click on below pictures to enlarge. • 4 x 30 lbs & 3 x 50 lbs stand-up rod and reel combinations & a selection of light spinning tackle. • 3 vertical gigging rod / reel combinations. • Wide selection of liplures, skirts, spoons & plugs. Kayaks (2 man plastic sit-on kayak), Water Ski’s, O’Brien tube, 4.5 m Inflatable Dinghy with 25hp outboard, fish finder, GPS, VHF radio and safety gear.